The Page is where you will create your webpage exactly as you'd like it. The default page width for your site is 1080pixels wide. This will provide a good viewing experience for the widest range of visitors to your site. 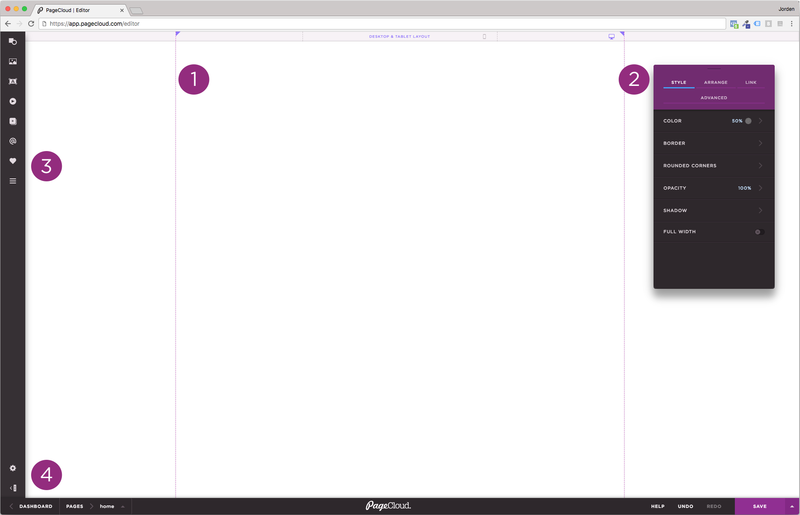 The dashed purple lines will help to show your page’s width. Learn more about your Page Width. The Editing Menu is where you will go to edit different properties of elements on your page. The Side Bar allows you to add professionally styled content to your page and adjust page settings. Add Images, Videos, and Objects. Learn more about the "Side Bar"
The Bottom Bar includes two sections. 1. Left side of the bar is for navigating through or adding new pages to your site. You can also navigate to your site dashboard from here. 2. Right side of the bar gives you access to save your site, connect with support, and hit undo and redo.